Almost 4000 tourists were evacuated on Wednesday in Paris, after a bomb threat at Eiffel Tower. 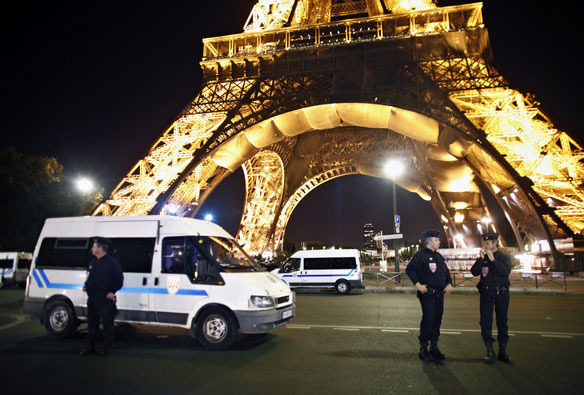 French police officers decided to evacuate the tower, after they found a suspicious package inside construction. Officials for French police said they received an anonymous call and they were informed by the existence of the mysterious package. The one who called also said that the monument will be blown up shortly after their phone talk is going to end. A police patrol went immediately there to check the place. After the package was analyzed by specialists they found no explosive substances, but they continued to investigate the area. The Eiffel tower was reopened for visitors a few hours later. It’s not the first time when the monument is under a bomb threat. Similar events already happened several times before. Last year in September, French officials announced the possibility of terror attacks by al-Qaida’s North African affiliate on crowded targets. That time, the tourists and population near by were evacuated twice due to bomb threats. Each time it was a false alarm, no explosives were found. French police said they haven’t discovered a link between the anonymous call and the package, but they think there is a connection. Currently, France is involved in an international military operation against Moammar Gadhafi’s forces in Libya. President Nicolas Sarkozy reacted rapidly to support rebels fighting, and French air forces began the attacks in Libya, increasing fears and reasons for France to be the target of attacks from extreme Islamic groups. France’s terror alert has been on high level,the red one, which is the second-highest level on its alert system, since 2005.